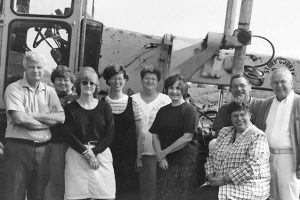 The Institute for Transportation at Iowa State University had its modest beginnings in 1983, with a Federal Highway Administration grant to provide training and technical assistance to the state’s city and county road agencies. In 1988, that initial program—Iowa’s Local Technical Assistance Program—was joined by one of the first-ever U.S. DOT-funded University Transportation Center regional programs. 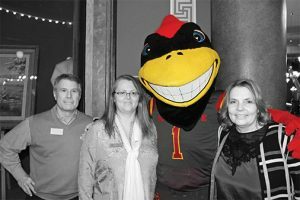 This addition greatly expanded Iowa State’s focus on, and the national impact of, programmatic transportation-based research and education. Through the years, several additional funded centers and programs have joined a synergistic collection of regional and national initiatives that are housed and administered under the banner of InTrans. From that initial LTAP budget of $100,000, the total InTrans annual budget has grown to exceed $19 million. Together these programs provide nationally renowned research, outreach, and training programs that every day make a difference in areas as diverse as transportation infrastructure, traffic safety, and mobility. The institute’s name has changed a handful of times since 1983 to reflect changes in the organization. In 2009, its status changed from a university center (Center for Transportation Research and Education, or CTRE) to an institute and was reflected in its new name: Institute for Transportation. View the expanded historical timeline below. Iowa State University is selected to manage one of only 10 statewide pilot programs in the country to provide transportation technology transfer and related services to small urban and rural areas. 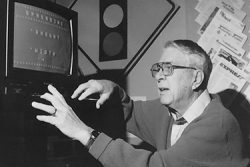 Stanley Ring led a $100,000 local technology transfer program that created the Local Transportation Information Center (LTIC), known today as the Iowa Local Technical Assistance Program (Iowa LTAP). Stanley Ring retires and Tom Maze becomes the LTIC director. Iowa State wins the University Transportation Center Program (UTC) grant from the U.S. Department of Transportation. The UTC grant funds the Midwest Transportation Center, under the direction of Ben Allen. 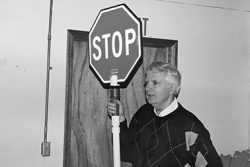 LTAP launches Safety Circuit Rider program with Ed Bigelow, a retired Ida County engineer, as Iowa’s—and the nation’s—first ever safety circuit rider. Leadership of the UTC grant transitions from Ben Allen to Tom Maze. The LTAP and UTC activities are merged under one organizational structure, the Iowa Transportation Center (ITC), with Maze as director. A strong partnership with the Iowa Department of Transportation (DOT) continues to grow, and the ITC’s overall research, education, and outreach programs flourish. The ITC has matured into a nationally recognized, multimillion-dollar-a-year program. The center’s name is changed to the Center for Transportation Research and Education (CTRE). The first Mid-Continent Transportation Research Symposium is held. CTRE signs a multiyear agreement with the Iowa DOT to regularize the department’s financial support of CTRE’s programs and to streamline contracting arrangements. 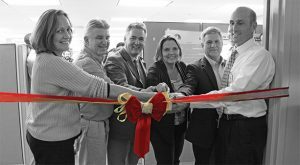 CTRE launches several new divisions—pavements, bridges and structures, traffic engineering and traffic safety, and policy—and moves into a 14,000-sq-ft facility. 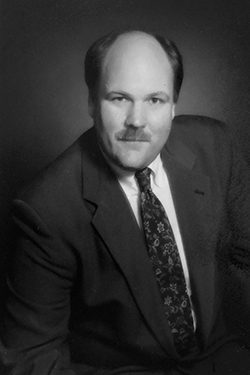 Stephen Andrle succeeds Maze as CTRE’s director. The Center for Portland Cement Concrete Pavement Technology is created. CTRE undertakes oversight of Iowa’s Statewide Urban Design and Specifications (SUDAS) manuals. CTRE conducts its first National Cooperative Highway Research Program-funded project. CTRE, with the help of the Iowa DOT and industry sources, purchases and equips two mobile research laboratories that travel the country performing research related to concrete paving and geotechnical materials. The Center for Weather Impacts on Mobility and Safety is created. The Center for Portland Cement Concrete Pavement Technology assumes a new, national identity and name—the National Concrete Pavement Technology Center. CTRE moves into a larger (23,000-sq-ft) space in the ISU Research Park. Lowell Greimann, retired professor and chair of civil engineering, becomes CTRE’s interim director when Stephen Andrle returns to the Transportation Research Board in Washington, DC. Shashi Nambisan becomes CTRE’s third director. CTRE now manages 11 long-term programs and won a nationally competitive, three-year Tier-1 UTC contract to operate the Midwest Transportation Consortium. LTAP offered 144 training opportunities to Iowa highway staff, including 55 related to safety topics. CTRE undergoes a status change from a university center to an ISU institute and receives a new name: Institute for Transportation (InTrans). CTRE remains a center within InTrans. Partnering with the FHWA, Forest Products Laboratory, and National Park Service, the Bridge Engineering Center (BEC) at InTrans oversees a national cooperative research program, the National Center for Wood Transportation Structures. InTrans’s geotechnical program becomes the Center for Earthworks Engineering Research (CEER) to reflect its expanded global partnerships and activities and sponsorship of a new, one-of-a-kind graduate degree program in geo-construction. InTrans oversees seven university centers and eight long-term funded programs. InTrans is awarded federal UTC funding totaling $2.52 million per year over the next two years to establish and lead the Midwest Transportation Center. Shauna Hallmark is named as InTrans director in February. CTRE embarked on three national safety-related projects related to driver distraction, in collaboration with three Midwest DOTs (Iowa, Minnesota, and Michigan). The doors opened on the new Traffic Operations Laboratory, a teaching and research lab that houses state-of-the-art technologies and provides real-time operations data. Partnership between the Bridge Engineering Center and the Iowa DOT Office of Bridges and Structures begins developing a bridge structural health monitoring (SHM) system that will allow for easier assessment of bridge conditions. Iowa LTAP helped begin a new Iowa traffic safety effort, the Statewide Multi-disciplinary Safety Team (MDST), to better coordinate interagency activity and information exchange with the Iowa DOT and the Iowa Governors Traffic Safety Bureau. The first Innovations in Transportation Conference is held. InTrans held more than 100 events with state and local agencies that had more than 3,600 participants. InTrans joins with three other Midwest universities on a five-year $1.5 million FHWA grant to examine ways to improve work zone safety. 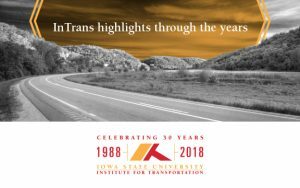 InTrans marks 30 years since its establishment with a public reception on December 11.